Harvey is an extreme storm that has set a new rainfall record. However, flooding in South Asia – a regular annual event – attracts limited attention worldwide. This year, among the main victims of this regular annual event have been the residents of Mumbai, India’s financial capital. On Aug 29, the city received over 200mm of rainfall within a span of 12 hours, almost 11 times more than average. Residents were reminded of the 2005 flood that left the city in a similar state of paralysis. Thousands of people lost their lives, and essential infrastructure – including airports, local trains, and power and telecommunication systems – was shut down. India is one of the world’s most flood-prone countries, with 113 million people exposed to floods. 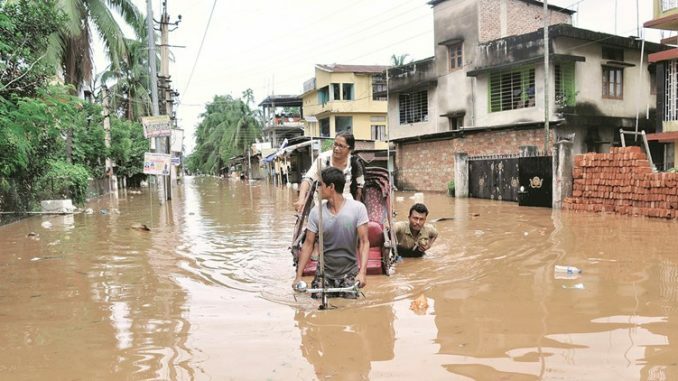 According to a United Nations report, India’s average annual economic losses due to disasters are estimated at US$9.8 billion (S$13.1 billion), of which over US$7 billion can be attributed to floods. Given India’s past experience with floods in urban areas, pre-emptive measures should have been taken to manage rising challenges presented by extreme weather events. Instead, urban ecosystems – comprising marshlands, wetlands, lakes and rivers that could moderate the effects of floods – have steadily deteriorated. Encroachment and illegal construction have steadily reduced the ability of cities to withstand serious flooding. Gurugram, which lies in a lowland area, has emerged as one of India’s most important industrial hubs. Yet, many of its residential areas are still not connected to any drainage system. It is not surprising that the roads there are severely water-logged every monsoon season, which results in traffic snarls that last up to 20 hours. In the case of Mumbai, the Bombay Municipal Corporation (BMC) spent only about 10 per cent of its designated funds on civil infrastructure last year. A media report earlier this year revealed that a large proportion of BMC’s money lies in fixed deposits earning interest for the corporation. Even funds used for renovating capital infrastructure address immediate civic pressures rather than provide for long-term infrastructure creation. Part of the blame for India’s urban infrastructure crisis also lies with citizen apathy. Nearly all cities have failed to encourage the adoption of rainwater-harvesting systems, even though such measures would greatly assist in diverting water to the subsoil or to a reservoir, instead of letting it overload the drainage system. Floods represent a major paradox for water management in India. Nearly all towns and cities are both water-scarce in dry seasons and prone to severe flooding during monsoons. Cities that experience floods every monsoon, such as Delhi, are also among the most water-stressed in the world. This is a serious indictment of India’s water management. India could follow Singapore’s example to stop urban flooding. The Republic, which also has to deal with monsoons, has for the most part solved urban-drainage and water-security problems by installing a proper, functional drainage system and collecting all rainwater for urban use.